It’s fair to say that I had a fantastic time on Australia’s Gold Coast, but it’s also fair to say that Surfer’s Paradise stinks. Not only was Schoolies on – and the town was full of spotty-faced teens as a result – but I really struggled to find a decent bar serving craft beer. Blurb on the bottle: 28 boasts balanced characters of citrus, grapefruit, passionfruit and lychee. Burleigh Brewing Company: A brewery in Burleigh Heads, Queensland. We’d actually stopped in town for lunch on our drive north, from Coolangatta to Surfer’s Paradise. If I’d known there was a brewery, I’d have sought it out (probably much to my wife’s chagrin, because I was the one supposed to be driving). Taste test: So, this is where all the hops in Australia have been hiding; until now, most of the beers I’ve been drinking have been remarkably restrained and subtle on this front. 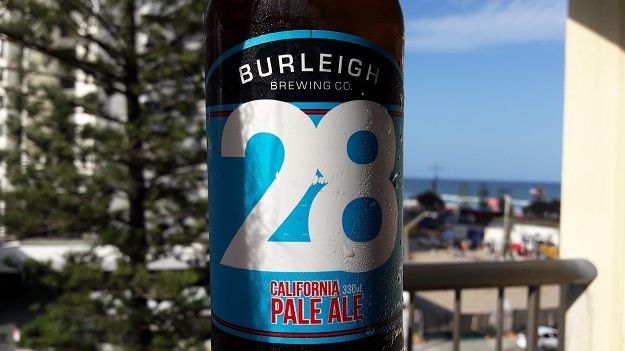 Burleigh Brewing’s 28 is obviously an Australian approximation of a classic American Pale Ale, which means vibrant hoppage, big flavour, and a strong aroma of stone fruits. This beer stays true to that formula. It’s zesty, moreish, medium in body, amber in colour, and a sweet finish to the day. The verdict: It’s not the best APA I’ve ever had, but, besides Stone & Wood’s famous Pacific Ale – a beer that I love but have had on a previous trip to Australia – I’d rate Burleigh Brewing Co’s 28 California Pale Ale as the best beer I’ve had all holiday. Beer/movie combination: In the spirit of California, I’m going to recommend a movie that you’ve surely all seen before, but it’s one that I re-watched recently and still really enjoy: Beverly Hills Cop. Like this beer, it’s not te best ever, but you’re guaranteed a good time.